The Michelin Tweel is an airless radial tyre comprising a rigid hub connected to a shear beam by means of flexible, deformable polyurethane spokes, all functioning as a single unit. Unlike conventional tyres, the TWEEL has no air, thereby solving what had seemed to be the unavoidable challenge of chronic flat tyres that plagues the landscape, construction, contracting, refuse/recycling and agricultural industries. Develped at Greenville in South Carolina it is being manufactured at a new plant that will produce both Michelin X Tweel SSL skid-steer yyres and Michelin X Tweel Turf as original equipment for John Deere to equip its ZTRAK 900 Series of zero-turn commercial ride-on mowers. 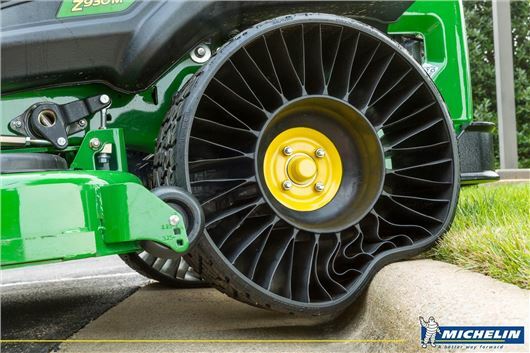 “The TWEEL airless radial tyre is the industry’s first commercialized airless radial solution and verifies Michelin’s leadership for the next generation of mobility,” said Ralph Dimenna, head of Michelin Tweel Technologies. Originally introduced as a concept at the 2004 Paris Motor Show, the Michelin X Tweel is the only commercial tyre available to offer the advantages of no maintenance, no compromise and no downtime. It performs with traditional radial tyre technology but requires no air, thereby eliminating the risk of a flat tyre. Desperate to find a solution to reduce their flat-tyre downtime, many industrial users resort to alternatives that result in diminished traction, handling and ride comfort. The Michelin X Tweel provides the advantages of no air pressure maintenance, easy mounting, damage resistance, increased operator comfort, reduced operator fatigue, improved productivity and longer wear life than pneumatic tyres. How will it function in a car? The ride will not be very comfortable. Will it comply with the regulations? At the moment they are only planned for use in agriculture/ industrial/slow moving vehicles. Possible use in low speed limited electric cars, or "milk float" types. Application in "normal" cars a million miles away, due to speed performance limitations.